The kitchen surface tops can easily be sanded back to their original colour even after years of use. The wood is American Oak, which has been stored in our stock for 1 year after being kiln dried and kept at room temperature so that the wood won't show drastic surprise expansions when it gets delivered to the home. We designed this kitchen in separate unique units so they can be easily re-arranged or moved to a new house with the family. Every unit is made out of 40x40 mil Oak just like in the old days when furniture was heavier and you still can find them holding their value in the stores. 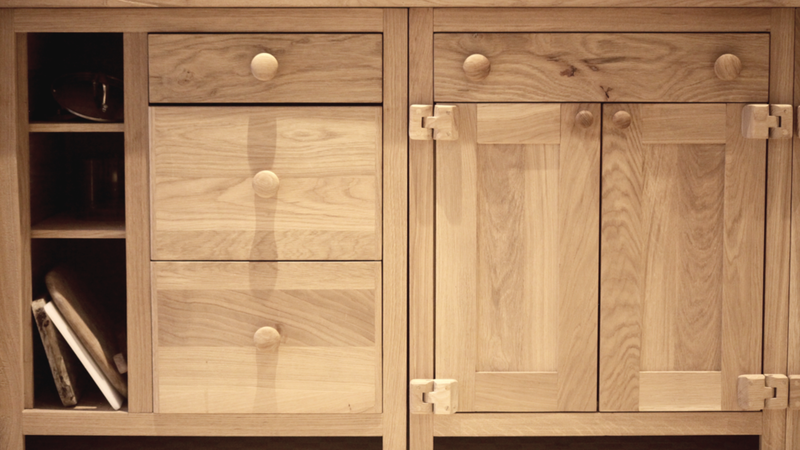 The doors are made out of 20mm solid oak that as well as giving rustic modern feel to the kitchen. We finish our kitchens with natural oils, 3 to 5 coatings.